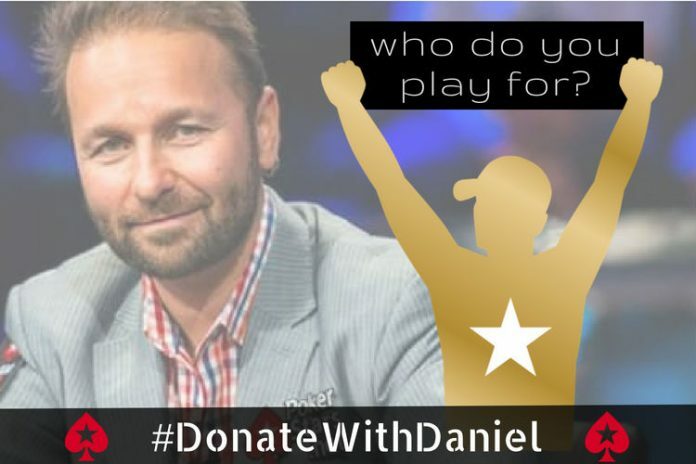 Daniel Negreanu is giving a Platinum Pass to one lucky winner who will be playing with charity in mind. There are still plenty of PokerStars Platinum Passes left to be won in 2018. However, only five more Platinum Passes are available to be earned as a part of the PokerStars Platinum Pass Adventure. The program enables PokerStars ambassadors to create unique ways for players to win their way to the 2019 $25,000 PokerStars Players No Limit Hold’em Championship. Now PokerStars personalities Daniel Negreanu, Maria Konnikova, Jeff Gross, Jen Shahade and Lex Veldhuis will be handing out passes. Each ambassador tasks their fanbase to perform something unique in an effort to be one of the people selected at a shot to win millions in the Bahamas. Negreanu understands that players are likely hoping for a score to change their own lives, but he’s asking for more. His challenge requires people to create a short video discussing a motivating charity, cause or foundation that would also benefit from having you playing in the PSPC. “You can make a huge difference for yourself and make the world a better place at the same time. So…who do you play for?” Negreanu said. Submit the video using the social media hashtag #DonateWithDaniel by September 30. Negreanu will select his top five finalists and then, on October 13 award the Platinum Pass. The four finalist videos that are not selected will all earn $1,000 for the charities or causes discussed. If the winner of the challenge cashes or, even wins, they will donate 50% of their earnings to the charity in their video. Maria Konnikova’s poker story is incredibly unique. After having set out to write a book about what it takes to become a professional poker player, she actually lived it out. She turned a victory in the $1,500 2018 PokerStars PCA National event for $84,000 into a sponsorship deal with PokerStars. Now, she’s giving away a Platinum Pass to someone else who has a story to tell. “I truly believe that creativity and storytelling are among the most valuable and most often overlooked skills in poker – and I can’t wait to see you embrace those skills in this challenge,” Konnikova said. Konnikova’s #mypokerstory challenge is looking for the most compelling story of what it means to be a good poker player. The social media savvy Jeff Gross has been creating YouTube vlogs for years and now he’s looking to inspire someone else to pick up a camera and begin to document their journey. Visit Gross’ YouTube Channel for more details on his challenge. Chess expert Jennifer Shahade found her way to to the felt by way of the chess board. Now, she’s hoping to find the next poker superstar among those who also share a love for both games. The #MyChessPokerGame challenge is asking the community to create a new game that incorporates elements of both chess and poker. “Poker is not just a game, but a passion, a science and a community, just like my first love, chess,” said Shahade. Shahade will select the finalists and a panel of poker and chess professionals will help select the winner, including Negreanu, Live Boeree and International Chess Master Danny Mensch. Team PokerStars Online Pro Lex Veldhuis has also opted for a person of charity to receive his Platinum Pass. Hoping to find someone who will pay it forward, Veldhuis is looking for someone who will take action by documenting themselves spending 20 hours for a charitable cause. Winners of each of the five Platinum Passes will earn a ticket to the $25,000 tournament plus an additional $5,000. Additionally, they will receive coaching and be mentored by the Ambassador who selected them. The PokerStars’ PSPC will take place January 6-10, 2019 during the 2019 PokerStars Caribbean Adventure in the Bahamas.